Thomas Hobbes (April 5, 1588–December 4, 1679) was an English philosopher, whose famous 1651 book Leviathan set the agenda for much of subsequent Western political philosophy. Michael Oakeshott famously described it as ‘the greatest, perhaps the sole, masterpiece of political philosophy written in the English language’. Hobbes also contributed to a diverse array of fields, including history, geometry, ethics, law, psychology general philosophy and what would now be called political science. His account of human nature as essentially self-centered, though a dark assessment, holds that people at their best can rise to self-interested cooperation. Hobbes was one of the first political philosophers who tried to explain and justify political authority without recourse to the religious justifications such as the divine right of kings. Instead he sought to ground political authority on a social contract by appealing to human experience. He was the first important empiricist and strongly reinforced that strand of English philosophy. His main concern was to establish the conditions for peace and stability so that people could be safe. To do this he thought that the sovereign should have a monopoly on force and use that power to enforce the law. He could not see the dangers of an absolute sovereign especially with the powers of the modern state at its disposal. However his key insight that the purpose of government is to establish and maintain peace and stability and at all costs to prevent social chaos and anarchy was correct. In that sense Hobbes was a defender of ordered individual liberty but not democracy. Hobbes viewed human beings as essentially selfish and thought that democracy could easily degenerate into chaos, poor government and eventually civil war. The kind of governments that would have been approved by Hobbes would include benevolent dictators and enlightened despots and monarchies. Hobbes was born in Westport, Wiltshire, England on April 5, 1588. His father, the vicar of Westport, was forced to leave the town, abandoning his three children to the care of an older brother Francis. Hobbes was educated at Westport church from the age of four, passed to the town's public school and then to a private school kept by a young man named Robert Latimer, a graduate from Oxford University. Hobbes was a good pupil, and around 1603 he was sent to Oxford and entered at Magdalen Hall. At university, Hobbes appears to have followed his own curriculum; he was "little attracted by the scholastic learning." He did not complete his degree until 1608, but he was recommended by Sir James Hussee, his master at Magdalen, as tutor to William, the son of William Cavendish, Baron of Hardwick (and later Earl of Devonshire), and began a lifelong connection with that family. Hobbes became a companion to the younger William and they both took part in a grand tour of continental Europe in 1610. Hobbes was exposed to European scientific and critical methods during the tour in contrast to the scholastic philosophy which he had learned in Oxford. His scholarly efforts at the time were aimed at a careful study of classic Greek and Latin authors, the outcome of which was, in 1628, his great translation of Thucydides's History of the Peloponnesian War into English. Hobbes believed that Thucydides's account of the Peloponnesian War showed that democratic government could not survive war or provide stability and was thus undesirable. Although he associated with literary figures like Ben Jonson and thinkers such as Francis Bacon, Hobbes did not extend his efforts into philosophy until after 1629. His employer Cavendish, then the Earl of Devonshire, died of the plague in June 1628. The widowed countess dismissed Hobbes but he soon found work nearby, again a tutor, this time to the son of Sir Gervase Clifton. Hobbes again toured Europe as part of his employment, this time becoming familiar with Euclid's work. In 1631 he again found work with the Cavendish family, tutoring the son of his previous pupil. Over the next seven years he expanded his own knowledge of philosophy, awakening in him curiosity over key philosophic debates. He visited Florence in 1636 and later was a regular debater in philosophic groups in Paris, held together by Marin Mersenne. Hobbes came home, in 1637, to a country riven with discontent, which disrupted him from the orderly execution of his philosophic plan. In this environment, Hobbes developed a set of arguments in support of the royalist position, which, while not originally intended for publication, reached the general public in 1640 under the title The Elements of Law. In November of 1640, Hobbes began to worry seriously about the repercussions of his treatise and fled to Paris. There, he rejoined the coterie about Mersenne, and was invited by Mersenne to produce one of the sets of "Objections" that, along with a set of "Replies," accompanied the original 1641 publication of René Descartes' landmark Meditations on First Philosophy. Hobbes' first area of serious study concerned the physical doctrine of motion. By the mid-1640s, he had conceived a system of thought the elaboration of which he would devote his life to. His scheme was first to work out, in a separate treatise, a systematic doctrine of body, showing how physical phenomena were universally explicable in terms of motion. He would then single out man from the realm of nature, and show what specific bodily motions were involved in the production of the peculiar phenomena of sensation, knowledge, affections and passions, particularly those relevant to human interaction. Finally, he would consider how men were moved to enter into society, and argue how this must be regulated if Men were not to fall back into "brutishness and misery." Thus he proposed to unite the separate phenomena of body, man and the state. He also extended his own works somewhat, working on the third section, De Cive, which was finished in November 1641. Although it was initially only circulated privately, it was well received. He then returned to hard work on the first two sections of his work and published little except for a short treatise on optics (Tractatus opticus) included in the collection of scientific tracts published by Mersenne as Cogitata physico-mathematica in 1644. He built a good reputation in philosophic circles and in 1645 was chosen with Descartes, Gilles de Roberval and others, to referee the controversy between John Pell and Longomontanus over the problem of squaring the circle. The English Civil War broke out in 1642, and when the Royalist cause began to decline in the middle of 1644 there was an exodus of the king's supporters to Europe. Many came to Paris and were known to Hobbes. This revitalized Hobbes' political interests and the De Cive was republished and more widely distributed. The printing was begun in 1646 by Samuel de Sorbiere through the Elsevier press at Amsterdam with a new preface and some new notes in reply to objections. In 1647, Hobbes was engaged as mathematical instructor to the young Charles, Prince of Wales, who had come over from Jersey around July. This engagement lasted until 1648 when Charles went to Holland. The company of the exiled royalists led Hobbes to produce an English book to set forth his theory of civil government in relation to the political crisis resulting from the war. It was based on an unpublished treatise of 1640. The State, it now seemed to Hobbes, might be regarded as a great artificial man or monster (Leviathan), composed of men, with a life that might be traced from its generation under pressure of human needs to its dissolution through civil strife proceeding from human passions. The work was closed with a general "Review and Conclusion," in direct response to the war which raised the question of the subject's right to change allegiance when a former sovereign's power to protect was irrecoverably gone. Also he criticized religious doctrines on rationalistic grounds in the Commonwealth. The first public edition was titled Elementa philosophica de cive. During the years of the composition of Leviathan he remained in or near Paris. In 1647 Hobbes was overtaken by a serious illness which disabled him for six months. On recovering from this near fatal disorder, he resumed his literary task, and carried it steadily forward to completion by the year 1650, having also translated his prior Latin work into English. In 1650, to prepare the way for his magnum opus, he allowed the publication of his earliest treatise, divided into two separate small volumes (Human Nature, or the Fundamental Elements of Policie, and De corpore politico, or the Elements of Law, Moral and Politick). In 1651 he published his translation of the De Cive under the title of Philosophicall Rudiments concerning Government and Society. Meanwhile the printing of the greater work was proceeding, and finally it appeared about the middle of 1651, under the title of Leviathan, or the Matter, Form and Power of a Commonwealth, Ecclesiastical and Civil, with a famous title-page engraving in which, from behind hills overlooking a landscape, there towered the body (above the waist) of a crowned giant, made up of tiny figures of human beings and bearing sword and crozier in the two hands. The work had immediate impact. Soon Hobbes was more lauded and decried than any other thinker of his time. However, the first effect of its publication was to sever his link with the exiled royalists, forcing him to appeal to the revolutionary English government for protection. The exiles may very well have killed him; the secularist spirit of his book greatly angered both Anglicans and French Catholics. Hobbes fled back home, arriving in London in the winter of 1651. Following his submission to the council of state he was allowed to subside into private life in Fetter Lane. In addition to publishing some ill-founded and controversial writings on mathematics and physics, Hobbes also continued to produce and publish philosophical works. From the time of the Restoration he acquired a new prominence; "Hobbism" became a fashionable creed which it was the duty of "every lover of true morality and religion" to denounce. The young king, Hobbes' former pupil, now Charles II, remembered Hobbes and called him to the court to grant him a pension of £100. The king was important in protecting Hobbes when, in 1666, the House of Commons introduced a bill against atheism and profaneness. That same year, on 17 October 1666, it was ordered that the committee to which the bill was referred "should be empowered to receive information touching such books as tend to atheism, blasphemy and profaneness… in particular… the book of Mr. Hobbes called the Leviathan." Hobbes was terrified at the prospect of being labelled a heretic, and proceeded to burn some of his compromising papers. At the same time, he examined the actual state of the law of heresy. The results of his investigation were first announced in three short Dialogues added as an Appendix to his Latin translation of Leviathan, published at Amsterdam in 1668. In this appendix, Hobbes aimed to show that, since the High Court of Commission had been put down, there remained no court of heresy at all to which he was amenable, and that nothing could be heresy except opposing the Nicene Creed, which, he maintained, Leviathan did not do. The only consequence that came of the bill was that Hobbes could never thereafter publish anything in England on subjects relating to human conduct. The 1668 edition of his works was printed in Amsterdam because he could not obtain the censor's license for its publication in England. Other writings were not made public until after his death, including Behemoth: the History of the Causes of the Civil Wars of England and of the Counsels and Artifices by which they were carried on from the year 1640 to the year 1662. For some time, Hobbes was not even allowed to respond, whatever his enemies tried. Despite this, his reputation abroad was formidable, and noble or learned foreigners who came to England never forgot to pay their respects to the old philosopher. In October 1679, Hobbes suffered a bladder disorder, which was followed by a paralytic stroke from which he died on December 4, 1679. He is said to have uttered the last words "A great leap in the dark" before expiring. He was buried in the churchyard of Ault Hucknall in Derbyshire, England. Like his contemporary Rene Descartes, Hobbes' philosophy is marked by a cautious optimism about our ability to overcome the limitations of our finite intellects and achieve knowledge of all aspects of the world we encounter. Like Spinoza, Hobbes was greatly impressed with the rigor of Euclid's Geometry, and believed that a similar level of rigor was possible with respect to physics, psychology, ethics and political philosophy. In contrast to the rationalists, however, Hobbes insisted on certain limitations of our knowledge in a way that foreshadowed John Locke's philosophical stance. It is no coincidence that Hobbes is most often thought of today as a political philosopher, for he believed that political inquiries were both more important and capable of more certainty than inquiries concerning entities not created by humans, and he focused his intellectual efforts accordingly. Hobbes accepted the Aristotelian logic of the day, seeing it as the system of the proper rules for thought (a view which stands in contrast to the more mathematical way many contemporary logicians understand their discipline). 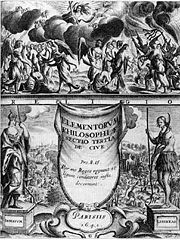 The importance of logic in philosophy, for Hobbes, is not that it leads to any substantive truths on its own, but rather that it works to establish the proper level of rigor for philosophical enquiry. In his Meditations, Descartes had claimed that some of our ideas were provided by the 'light of reason', and could not be derived from the senses. Among these ideas, he included all mathematical ideas (including that of space) and the idea of God. Hobbes rejected this approach, deriving all ideas from the senses in ways that would become standard fare for later British Empiricists. For instance, the idea of space is derived from mental images that present things to us as though they were distinct from us, and the idea of existence is derived from the thought of empty space being filled. His view that such apparently basic concepts were so derived made Hobbes suspicious of rationalist attempts to derive substantive truths from those ideas alone. Hobbes believed that humans were nothing more than matter, making him one of the most prominent materialists of the seventeenth century. Because of this, he believed that it was possible to explain human psychological operations in terms of the physical happenings of their bodies. For Hobbes, the central concept in physics is motion, so sensation is explained in terms of the communication of motion from external bodies to the sense organs. Thought is explained in terms of motions in the brain, and passions in terms of motions that the brain communicates to the heart. Certain motions within a body are essential to its remaining alive, and these are primarily regulated by the heart. Hobbes used the idea of such essential motions to explain the basic human drives. Things which, through their influence on our sense organs, promote the essential motions are objects of pleasure, and we naturally pursue them. On the other side, things which counteract the essential motions are objects of pain, and we naturally avoid them. Like Spinoza, Hobbes then derived the notions of 'good' and 'bad' from those of the pleasurable and the painful. As a result, he saw 'good' and 'bad' as inherently relative notions. On this view, nothing in the world can be said to be intrinsically good or bad; it is at most good or bad for certain beings. Because of this connection between the notions, humans naturally take sensations of pleasure as a guide to the good, but this can be misleading, for sensations of pleasure often lead us to ignore greater pleasures that can be had later at the cost of present pains. Because of this, philosophy has an important role to play in promoting human happiness, for logic-guided thinking is our best tool for discovering how to achieve the best life overall. Hobbes wrote Leviathan, or The Matter, Forme and Power of a Common Wealth Ecclesiasticall and Civil, commonly called Leviathan which was published in 1651. Its title comes from the biblical Leviathan. The book concerns the structure of society (as represented figuratively by the frontispiece, showing the State giant made up of individuals). In the book, Hobbes argues for a social contract and rule by an absolute sovereign. Influenced by the English Civil War, Hobbes wrote that chaos or civil war - situations identified with a state of nature and the famous motto Bellum omnium contra omnes ("the war of all against all") - could only be averted by strong central government. He thus denied any right of rebellion toward the social contract, which would be later added by John Locke and retained by Jean-Jacques Rousseau. However, Hobbes did discuss the possible dissolution of the State. As the social contract was made to institute a state that would provide for the "peace and defence" of the people, the contract would become void if the government no longer protected its citizens. In such a case, man would automatically return to a state of nature until the creation of a new social contract. In Leviathan, Hobbes set out his doctrine of the foundation of societies and legitimate governments. This became one of the first scholarly works on Social contract theory. In the natural condition of mankind, which other philosophers refer to as the state of nature, while some men may be stronger or more intelligent than others, none is so strong and smart as to be beyond a fear of violent death. When threatened with death, man in his natural state cannot help but defend himself in any way possible. Self-defense against violent death is Hobbes' highest human necessity, and rights are borne of necessity. In the state of nature, then, each of us has a right, or license, to everything in the world. Due to the scarcity of things in the world, there is a constant and rights-based, "war of all against all" (bellum omnium contra omnes). Life in the state of nature is famously "solitary, poor, nasty, brutish, and short" (xiii). But war is not in man's best interest. According to Hobbes, man has a self-interested and materialistic desire to end war — "the passions that incline men to peace are fear of death, desire of such things as are necessary to commodious living, and a hope by their industry to obtain them" (xiii, 14). Thus Hobbes identifies fear as the most powerful emotion. He forms peaceful societies by entering into a social contract. According to Hobbes, society is a population beneath an authority, to whom all individuals in that society covenant just enough of their natural right for the authority to be able to ensure internal peace and a common defense. This sovereign, whether monarchy, aristocracy or democracy (though Hobbes prefers monarchy), should be a Leviathan, an absolute authority. Law, for Hobbes, is the enforcement of contracts. The political theory of Leviathan varies little from that set out in two earlier works, The Elements of Law and De Cive (On The Citizen). Hobbes' leviathan state is still authoritative in matters of aggression, one man waging war on another, or any matters pertaining to the cohesiveness of the state. It should say nothing about what any man does otherwise; so long as one man does no harm to any other, the sovereign should keep its hands off him (however, since there is no power above the sovereign, there is nothing to prevent the sovereign breaking this rule). In actuality, however, the extent to which this sovereign may exercise this authority is conditioned by the sovereign's obligations to natural law. Although the sovereign has no legislative obligations, it is more beneficial for him to abide by those laws which prescribe peace for security (the laws of nature). Thus this conditions the authority of the sovereign with a prudential morality, or, more accurately, a moral obligation. A sovereign also maintains equality within the state, since the common people would be "washed out" in the glare of their sovereign; Hobbes compares this "washing out" of the common people in their sovereign's presence to the fading of the stars in the presence of the sun. In essence, Hobbes' political doctrine is "do no harm." His negative version of the Golden Rule, in chapter xv, 35, reads: "Do not that to another, which thou wouldst not have done to thyself." This is contrasted with the Christian golden rule, which encourages actively doing for others: to Hobbes, that is a recipe for social chaos. 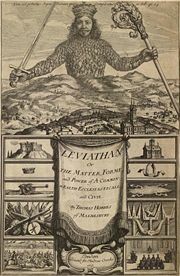 Leviathan was written during the English Civil War and much of the book is occupied with demonstrating the necessity of a strong central authority to avoid the evil of discord and civil war. Any abuses of power by this authority are to be accepted as the price of peace. In particular, the doctrine of separation of powers is rejected: the sovereign must control civil, military, judicial and ecclesiastical powers. In Leviathan, Hobbes explicitly states that the sovereign has authority to assert power over matters of faith and doctrine, and that if he does not do so, he invites discord. Hobbes presents his own religious theory, but states that he would defer to the will of the sovereign (when that was re-established: again, Leviathan was written during the Civil War) as to whether his theory was acceptable. Tuck argues that it further marks Hobbes as a supporter of the religious policy of the post-Civil War English republic, Independency. 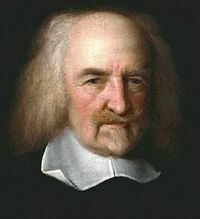 Thomas Hobbes also touched upon the sovereign's ability to tax in Leviathan, although he is not as widely cited for his economic theories as he is for his political theories. Hobbes said, "Equal justice includes the equal imposition of taxes. The equality of taxes doesn’t depend on equality of wealth, but on the equality of the debt that every man owes to the commonwealth for his defence." Put simply, Hobbes believed that taxes were necessary to support the military and that the military was necessary to enforce the rule of law. Thus, Hobbes saw taxes as a necessary support of the rule of law. 1681. Posthumously Behemoth, or The Long Parliament (written in 1668, unpublished at the request of the King). ↑  earlymoderntexts. Retrieved June 23, 2008. Mintz, S. The Hunting of Leviathan. Cambridge: University Press, 1962. Oakeshott, Michael. Hobbes on Civil Association, 1937. All links retrieved February 27, 2014. Works by Thomas Hobbes. Project Gutenberg. Luminarium: Thomas Hobbes Life, works, essays. Hobbes at the Internet Encyclopedia of Philosophy. Hobbes Moral and Political Philosophy at the Stanford Encyclopedia of Philosophy. Timeline Brief bio Philosophy Dept. Oregon State University. A Brief Life of Thomas Hobbes, 1588-1679 by John Aubrey. Leviathan The University of Adelaide. Leviathan, available for free via Project Gutenberg. A short biography of Thomas Hobbes. Atheism. This page was last modified on 27 February 2014, at 16:38.